There are a couple of reasons that I have not been attempting to do episodic reviews of the final eight installments of Breaking Bad: firstly, it is the type of show that I want to enjoy the episode without thinking about what I am going to say about it afterwards; and I am trying not to remind anybody that I failed to write anything about the final two hours of the most recent season of Mad Men. However, as we enter the final five weeks of Breaking Bad, it has hit heights this season that for me, make it very secure in its spot of the second best show in the history of television, behind only The Wire. 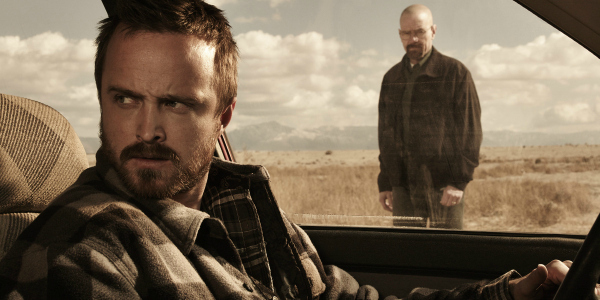 The advantage that Vince Gilligan’s series does have over David Simon’s piece is the number of people watching live – the midseason premiere of Breaking Bad drew over five million viewers, whereas the final season of The Wire had ratings under one million. I was one of the many that watched The Wire after it had aired, plowing through all sixty episodes in a month and being completely blown away by it, but it did not give me any chance to reflect over the course a week as to what I thought was going to happen next (which was usually heartbreaking devastation, but once in a while, someone would walk up the stairs to a dinner table and it would be more resonant than anyone who has not yet watched the show could imagine). With Breaking Bad – everybody has a prediction as to what might happen and – after the jump, to avoid spoiling it for anybody who might not yet be caught up – I am going to offer my theory as to where the next five hours are taking us. In their first ever Premiership home match, Cardiff City beat Manchester City 3-2 in South Wales, with all of the goals coming in the second half. City, who finished second last term and are only a season removed from being the defending champions, took the lead seven minutes into the second half with a stunning strike from 25 yards by Edin Dzeko, who had been played in by a Sergio Aguero backheel. However, the advantage for the visitors lasted only eight minutes as Aron Gunnarsson scored Cardiff’s first top flight goal in more than 51 years, as he pounced on a loose ball in the area after Joe Hart could only parry a shot by Fraizer Campbell. The England keeper was then at fault for Cardiff’s second, flapping at a brilliantly delivered corner from Peter Wittingham that was headed into the empty net by Campbell. A product of the Manchester United youth academy, Campbell, who cost the Welsh side just £650,000 when they bought him from Sunderland in January, showed his aerial prowess again three minutes from time, converting another set piece to give his team a 3-1 lead. Manuel Pelligrini’s side did put up a fight and pulled the deficit back to one with a goal from summer signing Alvaro Negredo, but the Welsh side held on through six minutes of injury time for a famous victory. 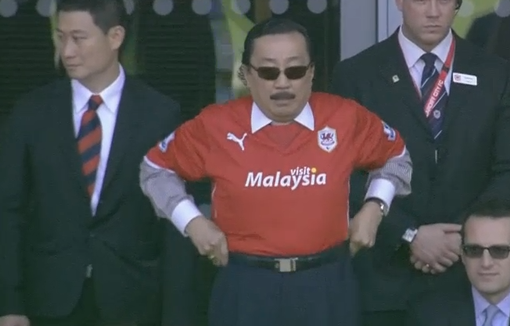 The continuing controversy of the club’s rebranding was in evidence during the jubilant scenes at the final whistle, as most of the crowd were wearing Cardiff’s traditional blue colors, while only some had adopted the new red strip that was brought in by owner, Vincent Tan last summer. Nevertheless, his presence on the sideline – looking more like a character created by the late, great Andy Kaufman, than a billionaire businessman – did not dampen the supporters’ celebrations and, if there are many more days like this at the Cardiff City Stadium, it would not be a surprise for the crowd to be a sea of red by the end of the season. For the first time since August 2000, Arsenal lost their first match of the Premiership season and the home supporters at the Emirates let Arsene Wenger know their displeasure about his lack of spending in the transfer market. Although the Gunners have been linked with (among others) Gonzalo Higuain, Luis Suarez, Wayne Rooney, Ashley Williams and Luiz Gustavo this summer, the only player the club has added over the summer is the 20-year-old French striker, Yaya Sanogo, who is currently injured. An inability to get from bid to sealing the deal has been identified as a major problem for Arsenal, with the board seemingly unwilling to spend an extra couple of million to ensure their target does not go elsewhere (as happened with Higuain and Gustavo, who went to Napoli and Wolfsburg respectively). 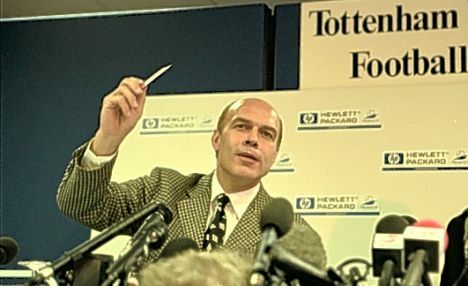 Some fans have been pointing to the departure of former Vice-Chairman, David Dein, as the point when the Gunners began to struggle in the transfer market, as he was considered responsible for convincing many of the best players the club has ever had to join, including: Ian Wright, Dennis Bergkamp, Sol Campbell, Cesc Fabregas, Thierry Henry, Robert Pires and Robin Van Persie. 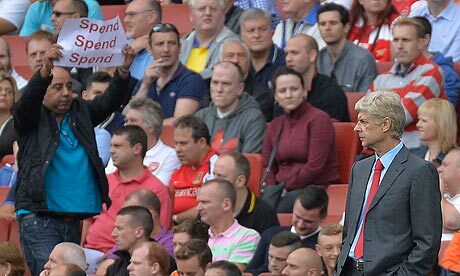 As a Tottenham fan, I cannot deny getting some enjoyment from seeing Arsenal supporters upset at their team, heading for the exits early and holding up signs saying “Spend Spend Spend” to Arsene Wenger. However, the actual events on the pitch do not reflect this level of aggravation from Gooners, since they were very unlucky to lose the game and only did so because of poor decisions from the officials. The record shows Aston Villa won the match 3-1, having gone behind early to a strike from French striker, Olivier Giroud, but Paul Lambert’s men responded with a double by Christian Benteke and a goal from Antonio Luna on his debut for the Villains, but this does not tell the whole story. Many pundits pointed out that the away team’s second penalty, which gave them the lead just after the hour mark, was an incorrect decision, since Laurent Koscielny played the ball first, but what was not picked up on was that Villa’s equalizer was also dubious. In the 21st minute, Gabriel Agbonlahor went on a strong run through the Arsenal defence and was brought down in the box by Wojciech Szczesny – a clear foul, but referee Anthony Taylor played the advantage as the ball broke to another Aston Villa player in the box, who subsequently shot into the side netting. At this point, Taylor went back and awarded the penalty, which is incorrect, since Law 5 states that he should only go back and penalize the original offence if the anticipated advantage does not develop – allowing the shot on goal was in itself the advantage and he should not have brought the play back to the foul once that attempt went wide. Predicting this Premiership season could prove to be a fool’s errand, with the top looking completely open and the bottom being a crap shoot as to who starts well and who can make the necessary acquisitions in January to steer away from trouble. Instead of doing my forecast for the table in numerical order, I am going to start with the prognostication I feel strongest about and then work down to the positions I am basically rolling a dice on (N.B. Last year, I predicted that West Brom – who ended up 8th – would be bottom, so take the below with a pinch of salt, a dash of lemon juice, and a healthy serving of cynicism). 5th Place – Tottenham Hotspur Waffles The fact is, Spurs could be top at Christmas, Arsenal bottom, yet somehow they would contrive a way to finish above their North London rivals for the 459th time in a row (okay 19th, but seriously, what’s the difference at this point). Losing Bale looks inevitable, but Andre Villas-Boas showed much tactical acumen (last season, he actually made substitutions that worked, even when I disagreed with them…who changes their left-back when you need a goal?) and seems to have gelled the team together in a manner that many of his predecessors failed to do. If the Waffles can recruit another Belgian striker and get a good replacement in for Bale, then they might have a chance of a cup run, or look like they are going to be in the Champions League until the final day. One way or another, we will end up fifth. Side note – the NBC (who will be taking over the broadcasting of live games in the US this season) commercial with Jason Sudekis as an American football coach in charge of Tottenham would have been a lot funnier had he not seemed more competent than our one time manager, Christian Gross. Champions – Chelsea I really did not want to predict that they were going to win the title, but it is really hard to argue with Jose Mourinho’s record of success and he has proven that he has the ability to win a title in his first season at a club, having done so in both London and Milan. The Blues have added tough-tackling Andre Schurrle from Bayer Leverkusen to their already strong midfield – expect Eden Hazard to build on his excellent first season in the Premiership – and, if they can add some firepower up front in the form of Wayne Rooney or Romelu Lukaku, who is back at the club following a successful spell on loan at West Brom last season; or if they can get Fernando Torres back to the form of which he is capable) then the league title could be a walk in the park for the Stamford Bridge outfit. Each year, the gap between the end of the Premiership season in May and the start of the new one in August seems to be much longer than the three months it actually is, especially in years – such as this one – where there is no major international tournament taking place over the summer. Football fans have to make do with following transfer sagas; analyzing the new fixture list when it is released; and watching lesser competitions like the Confederations Cup – which was won this year by Brazil, though their success was marred by riots in the country as part of the population protested against them hosting the World Cup next year at great expense, when the economy is struggling. Nevertheless, the wait is over this weekend as the Premiership kicks off for a brand new campaign and one that is perhaps the least predictable of any of recent years, with three of last season’s top four finishers having new men in their dugouts. 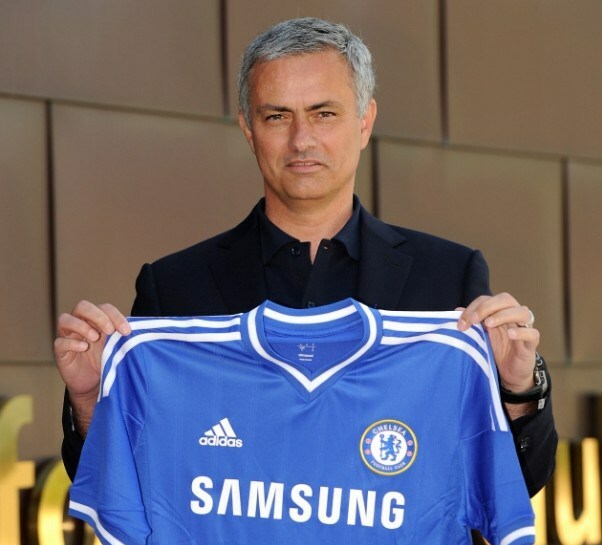 Chelsea replaced the much maligned Rafa Benitez – who helped the club finish third and led them to a Europa League victory, but was never accepted by the Blues fans – with their former boss, Jose Mourinho, who is back for a second stint at Stamford Bridge. In his first spell at the club, he won the league in his first two seasons and also added two League Cups and an FA Cup to their trophy cabinet before he was fired/left by mutual consent. During Mourinho’s time away from the Premiership, he has enjoyed success at Internazionale, with whom he won the Champions League and Serie A titles; and Real Madrid, where he interrupted Barcelona’s run of topping La Liga and racked up a record points tally in the process (okay the other two campaigns ended up with Real finishing below their rivals, but this is Barca we are talking about, they’re no mugs). While Chelsea have been linked with a deal for Wayne Rooney this summer, their two major signings have strengthened an already good midfield, with Andre Schurrle (bought from Bayer Leverkusen for £18m) and Marco van Ginkel (Vitesse Arnhem, £8m) being added to Mourinho’s squad alongside the likes of Juan Mata, Eden Hazard, Oscar and the veteran, Frank Lampard. Manchester City decided that winning the club their first title in 44 years did not make up for the fact that Roberto Mancini could only guide them to second place the year after that success, so he was fired and Manuel Pelligrini has been recruited from Malaga to replace him. The Chilean also previously managed Villarreal and had a season in charge of Real Madrid, but since moving to Europe, he has failed to guide his teams to any trophy victories. What he will have access to is almost unlimited funds at Manchester City and the board have already backed him with the signings of the midfielders Fernandinho (who cost £30m from Shaktar Donetsk) and Jesus Navas (£22m, Sevilla), alongside the arrival of strikers Steven Jovetic (£22m, Fiorentina) and Alvaro Negredo (£20m, Sevilla), who come in to replace the outgoing Carlos Tevez (Juventus) and Mario Baloteli (A.C. Milan).